EPB (Electric Power Board) is the municipal utility for Hamilton County, Tennessee. It takes power generated by the Tennessee Valley Authority (TVA) and provides it to 170,000 residential, commercial, government, and industrial customers, making EPB one of the largest publicly owned power distributors in the country. 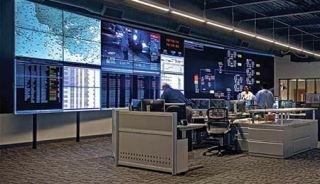 Its EPB Control Center in Chattanooga is the hub of a 100 percent fiber optic network, which delivers electricity and also feeds two large Planar videowalls that operators use to keep tabs on every aspect of the electrical grid and ensure that customers receive reliable, cost-effective power. In collaboration with the systems integration firm, Whitlock, EPB selected the 55-inch Clarity Matrix with G2 Architecture (MX55HDU) for the control center. The primary videowall is a ten-wide-by-four-high (10x4) array of displays which depict all required operational information. A four-wide-by-three-high (4x3) videowall, installed perpendicularly to the primary videowall, depicts any additional information that operators or managers need to monitor and manage the network.